Schizostylis or Kaffir lilies from South Africa come in crimson, pink and white. They like a sunny position, moist, rich soil and are flowering now. I dug up mine and divided them in spring to great effect. Their bright crimson flowers look fab in a tall vase with some flowers snipped from my Miscanthus grass. Gladiolus papilo is another South African native and needs a sunny spot with moist soil. Flowering from late summer, the flowers grow to about 90cm in height. The high winds from Hurricane Katia threw mine around a little bit and I will be staking it next year. It is an unusual, elegant flower with very pretty coloring. It is as good a cut flower as the larger flowered hybrids that we commonly see in flower displays. I had nearly given up all hope of seeing Sunflowers in the garden this year. Our youngest son, John, grows them with his pumpkins every spring on the playroom windowsill and would have been genuinely perplexed had his pride and joy not delivered. It has not been plain sailing this year. 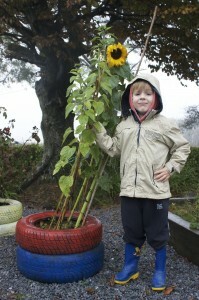 We planted out the first batch of standard yellow sunflowers in May. They were very quickly blown to bits by the high winds. Sunflower black magic (the name appealing greatly to my imaginative five year old) was then sown directly into the ground in June and got munched by slugs. This giant variety (pictured) was eventually sown by John in his brightly painted car tyres later in June. The slippery sides of the tyres gave better protection from the slugs and snails and these ones have succeeded to grow quite tall. I had given up all hope of them actually blooming and thank goodness one of them has managed to brave the elements exposing its bright sunny face. I can only conclude that it most have gotten wind somehow, of the forecasted heat wave which of course cruelly eluded us here in Cork. We popped some bamboo canes in for support and it is no longer holding its head quite so high, but the youngest gardener in the house is satisfied, and that’s good enough for me! Early autumn is a good time to start taking cuttings. Pelargoniums, fuschia, lavender, artemesia and penstemons are among the many plants that can be propagated in this way now. Mix plenty of sand with your compost and take a good firm cutting. Pop a plastic bag over the top to make a mini-greenhouse and keep in the glass house or potting shed. Rooting your own plants is a great way to save money. You can also divide hellebores, hostas, brunneras and any other early flowering perennials such as irises now too. Pop your summer bedding plants on the compost heap now and replace with cyclamen, violas and winter pansies. Winter pansies are edible and add great colour to the vegetable patch as well as window boxes and pots. They will need protection in freezing temperatures so have a bit of horticultural fleece in the shed for later on. Their flowers, like all edible flowers, look beautiful in salads. I have finished planting daffodils and still have some Alliums to pop in the ground. I picked up a packet of Allium Sphaerocephalon in Lidl for half nothing. I am also planting white and purple Camassia’s. A spell of dry, clear weather would make the job a lot more enjoyable…here’s hoping!